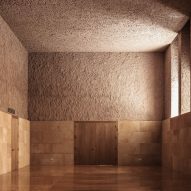 Italian architect Antonino Cardillo has coated the walls of a vaulted chamber-music and events space in lumpy coral-pink, grey and green plasterwork. 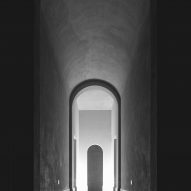 Cardillo designed the space called Specus Corallii, which translates as The Coral Cave, within a baroque oratory in Sicily owned by the Cathedral of Trapani. The room will be used as a venue for chamber music and lectures, and occasionally as a ballroom. Its design is inspired by the shell and coral imagery associated with the city of Trapani, which is a major fishing port on Sicily's western coast. "I proposed to the client a radical idea: reconstruct the space like a novel that refers to the founding myths of the ancient city," Cardillo told Dezeen. "The colour and tactile surfaces of the Specus rediscover the sensuality of the stone and dust that speak of the place and the bowels of the earth where they were carved," he added. "Thus the Coral Cave, with its evocation of a mysterious underwater dimension, relates that consciousness which, from the sea, has sedimented for millennia the sense of the life of the city and its landscape." The vault of the main room is covered in roughly applied plaster and painted a muted pink. 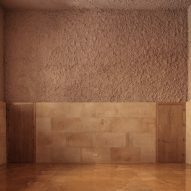 The lower parts of the wall are lined in large slabs of porous limestone, a material also applied in its polished state to the floors. Deeply recessed windows set high in the walls above the limestone dado bathe the space in natural light. This dado also contains solid chestnut doors, which harmonise with the warm-toned walls and flooring. "It is a kind of hand-cast plaster energetically applied by masons – this is usually the first layer of a generic plaster," explained Cardillo. "Textural surfaces stimulate the tactile aspect of our senses, suggesting to us that something else exists beyond the visible," he continued. "Beside this, the act of making hand-cast and rough surfaces is liberating, both aesthetically shaping it, the eroticism potentially concealed in any building site which is usually repressed or banalised by the modern process to build." The walls and vaulted ceilings of a dramatically dim hallway are covered in contrasting cool-toned green and grey plaster, while the floor is made up from a combination of polished and matt green terrazzo tiles. 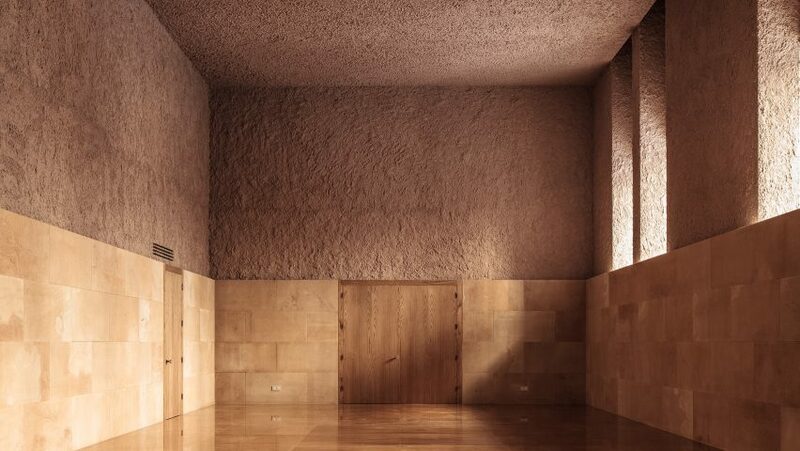 Specus Corallii is the latest in a string of projects by Cardillo featuring heavily textured plasterwork. 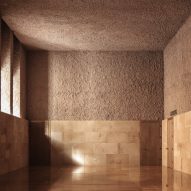 Another, named House of Dust, is a Rome apartment with lumpy brown walls and ceilings, while his Illuminum Gallery combined scent with texture for a fragrant installation. 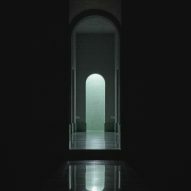 Photography is by Antonino Cardillo.